The Design II spring exercise consisted of two different, yet connected parts. The first part focused on the design of a door sited within an indefinitely extended generic wall. The second was concerned with the design of an inhabitable space located on one side of the door. The first vantage point was a geometric one that considered the door as the only point in common to any three intersecting planes. The three planes could be considered, respectively, as the plane on which a subject would stand, the plane along which he/she would move and the third one against which he/she would collide. 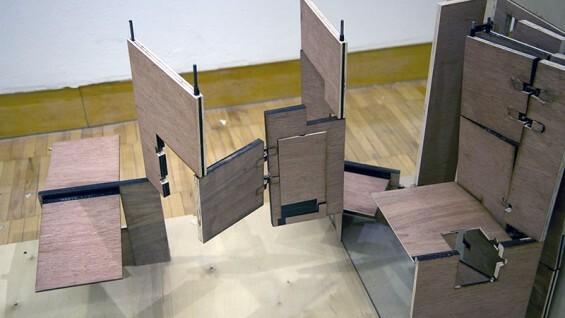 The second vantage point considered the door as a topological element that produces simultaneously separation and connection between two different environs assumed to be an interior and an exterior. Their definition ultimately defines the salient characteristic of the artifact. A third vantage point considered the intimate relation of the human body, in particular the head, the hands, and the feet, with the door and the separate elements of its complex program. 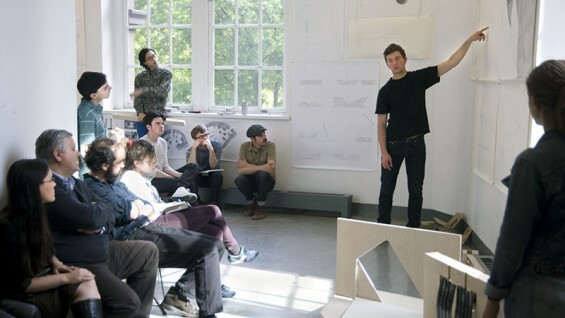 The early phase of the design was supported by analytic considerations of different examples of doors chosen by the students, of their mechanisms and of theirs spatial characteristics and implications. The final design was developed at the scale of 3"=1'. The second part of the design exercise consisted of the definition of an inhabitable space for one individual—the one operating the door—and a possible visitor. This inhabitable space was to be considered exclusively as an interior located behind the door and embedded in a generic built mass. The program of inhabitation was conceived in its minimal form, comprised of the functions necessary for the existence of one inhabitant, and referring to three archetypical conditions of a body in space: standing, sitting, and lying horizontally. The project was developed at the scale of 1"=1'. Man inhabits space, a space that is all one–free, public, accessible space. The first act of architecture is when the man takes an object–one that can be fixed and unfixed–and seals off the space of a cave relative to the space outside of a cave. This is the creation of exterior and interior. With the placement of the door, man decrees, "That is outside, this is my bedroom." The placement of the door was an act of creation of great magnitude. At that moment, the door began the process of its evolution. The door gave birth to program as it filled its first function: creating two spaces while simultaneously defining the relationship between them–not as same / same or other / other, but as two spaces that relate to each other in a specific regulatory fashion. The door decides who comes and goes, and who will use the space. Prehistoric man leaves the exterior to retire to his space. His door, created by his hand–a representation of his will and creativity–is the mark of his space. An outsider is physically able to enter, but understands that in doing so, he is entering a claimed, foreign space. This ability to physically enter the cave changes, however, as the door evolves. At moments along the evolution of the prehistoric door, the door begins to regulate temperature and airflow as man discovers ways to eliminate gaps around the door. The door becomes more sturdy and secure to exclude wild animals, and the invention of a locking mechanism can exclude other human beings. The door is made more aesthetically pleasing to mark the importance of transitioning between the two spaces regulated by the door. The door is made of lightweight materials and the hinge is constantly improved upon in order to increase the ease of using the door. The door eventually anticipates visitors, both welcome and unwelcome, and a knocking etiquette and knocking mechanisms come into existence. At a certain point it becomes important to view the exterior from within the interior, and the door takes on some qualities of a window as peep holes or panes of glass are inserted into it. This project began with an exploration of three intersecting axes. The technical and physical exploration of the doors and a conceptual program were introduced as a later step. I began exploring the physicality of a door swing as it moves between to planar axes and the programmatic possibility of a threshold moment of sensory isolation. The physical articulation of the door swing led to a spatial container for a body to move through. The swing of a revolving-type door creates a new threshold space from an existing one-dimensional frame. These design explorations led to a spatial frame that embraces the program of sensory isolation. A threshold experience - silence and darkness, the intended programmatic conditions - was brought about via the exploration of a door revolving between axes and contained within its frame. Eventually, a space for isolation and voyeurism was explored as the "house" behind the door. A door is the threshold between two spaces that creates different relationships between the inhabitants of the interior and the exterior. The forces of pushing and pulling are distinctly different, yet most doors operate the same way on both sides. To distinguish and embody the differences between the two forces into the mechanics of a hinge, I made several studies mapping out relationship between the body and the door. In my final design, I created a door with a different entry and exit condition. On the exterior, the door appears to be a voluminous mass and this illusion is accentuated with a handle inserted deep into the door within a pocket. When the door is pulled, it “opens” into a vestibule, moderating the interior and exterior. To allow complete entrance into the interior space, the door must be fully close behind the inhabitant. From the interior, the door works in almost the opposite way. The process of exiting is straightforward and direct. As the inhabitant exits the interior, the door easily opens, pushing the inhabitant out. A door creates expectations and is a device the body negotiates with in order to enter from one space to another. The door I designed provides entry into a private space for only one individual. The action of opening the door and entering through it requires two steps. To open the door, one rotates the circular handle while it remains in a vertical position, with both arms stretched out. To enter, one pushes the handle forward and walks through the opening. As the person walks through the threshold (and through the center of the circular handle), the handle completes a sphere around the upper body. The person closes the door from the inside, leaving the handle within the interior space. The handle disappears from the outside, leaving the door inaccessible from the exterior. The movement of opening-entering-closing the door is ritualistically choreographed to celebrate the body and its relationship with the spaces that are separated by the door.